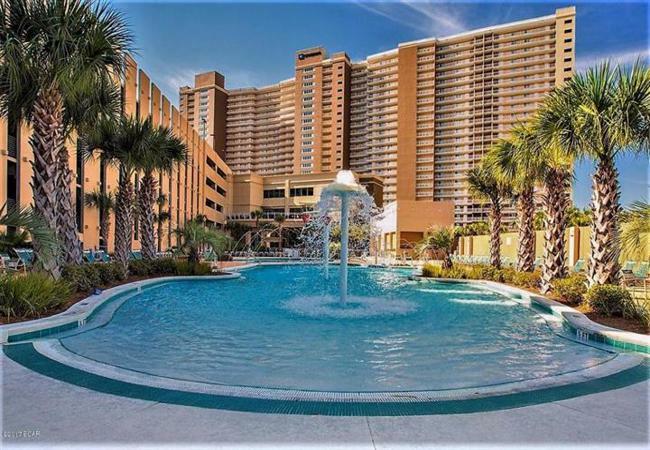 Stay in a condominium at Emerald Beach Resort if you want to spend a vacation in Panama City Beach, Florida, in luxurious surroundings. You can soak up the sun lying by the resort’s pool or stretching out on the private beach. The beach is more than 900 feet long. If you want to enjoy outdoors in a shady spot, relax on your condo’s private balcony. The resort’s combination of wooden furniture and beach décor make it an elegant place to spend your beach vacation. You will appreciate the amount of space in these large Panama City Beach vacation rentals. The largest condos have three bedrooms and three bathrooms. Emerald Beach Resort has great places for you to begin and end your day. Stop at Starbucks for your morning cup of coffee. Visit the Skybar on the resort’s Sky Bridge to have an evening cocktail while you watch television. You will find plenty of things to do in Panama City Beach between your morning cup of coffee and your evening cocktail. If you play golf, you will enjoy playing on the 27-hole course at the nearby Hombre Golf Club. Your whole family will enjoy visiting Frank Brown Park. Try your luck in the park’s fishing lake, take a hike on one of the park’s trails or watch the children play on the playground. There are picnic areas where you can eat and relax. Visit St. Andrews State Park if you want to spend some time enjoying the water. You can go snorkeling or scuba diving if you want to explore the water. If you enjoy boating, take a kayak or a canoe out on the water. You can lie on the beach if you want to relax. Hike along the nature trails to see a variety of birds and plants. If you enjoy shopping, you will not want to miss The Shoppes at Edgewater. This outdoor mall is just across the street from the Emerald Beach Resort. Clothing and accessories are available in the shops here. You will find a variety of restaurants here and at Pier Park. Pier Park also has department stores. You will enjoy returning to your condo at the end of the day. These Panama City Beach vacation rentals have full kitchens. Enjoy a view of the beach while you have an evening snack on your balcony. You can relax inside the condo while you watch cable television.